FlexiStation runs in the background of your computer, logging your hours worked and reporting that information to your organization's FlexiServer Management System. 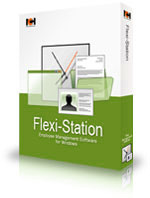 The first step is to download and install FlexiStation. You will need to enter the logon details that were emailed to you when you were added as an employee to the company's FlexiServer. Use the Web button on the toolbar to open the web interface where you can view reports on how many hours you have worked, as well as perform the same actions as in the program, including adding hours and requesting time off. go into Private mode if you need to complete personal tasks and want to temporarily stop the clock and disable screenshots being taken of your screen. 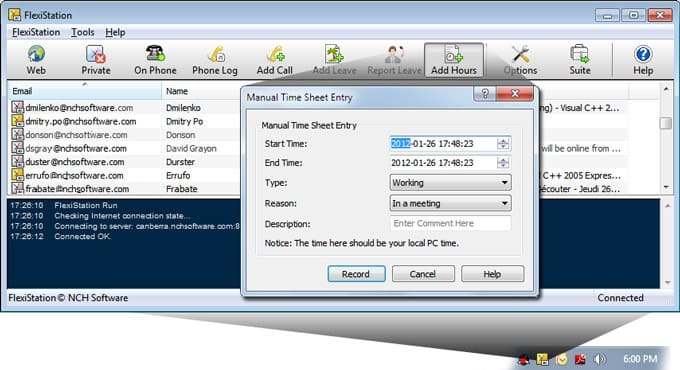 Make a manual entry to your time sheet when you return from a meeting or from working away from your desk. Enter a leave request that will be emailed to your supervisor. You will be notified by email once your request is approved.